Any time you want to add to your fakes collection buy a candy colored " jade" cab on ebay. We have a good thing going when we can trust our stone suppliers. You definitely want to have a real fake in your collection rather than a fake fake. My wife checks carefully when she buys flowers. She looks real closely to ensure that they are real plastic flowers, not the fake plastic ones you see all the time! Bob you got me there, I know that I am tired but it took a couple of minute thinking about fake plastic flowers. they still look good. There is some other fake things I have enjoyed looking at. I like real genuine imitation leather. Okay, that is funny, but???? Is turquoise (etc) that has been smashed, heated and glued together Fake, Genuine, or ????? I am not against simulated or lab grown, just like to know what I am buying. I now wonder how many fakes I own and it is now stuck it in my head like a bad tune. Not all fakes are from Morocco. Chinese turquoise is for the most part howellite which has been dyed. Morocco & China are well known for fake and/or reconstructed fossils. But that isn't saying that all fossils from these countries are fake. 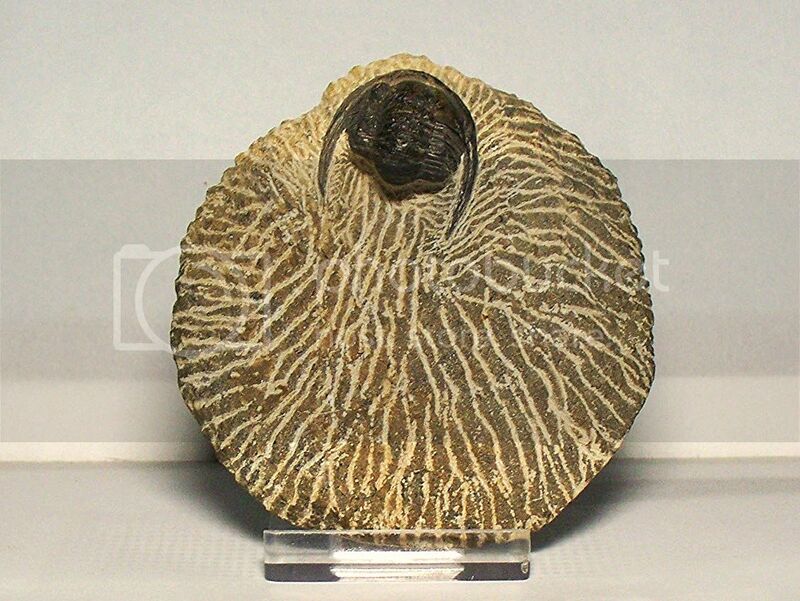 Here is a fake, or at least partially fake fossil from Morocco. The matrix this trilobite sits on is made up of epoxy and local sand. The trilobite itself has been constructed from at least two similar trilobites, with colored epoxy used to fill in any gaps. The Moroccans are getting very good at creating fossils from scrap pieces, and have even fooled a couple of museums. Strong magnification will reveal tiny air bubbles in the epoxy used. And a needle heated to red hot and pressed into the matrix will give off the smell of burning plastic. I bought this "fossil", knowing that it was a fake to use as an example to teach people with. Although marketed as "Block Turquoise" some of it contains no turquoise at all (they'll crush whatever soft stone they have at hand). It is more properly a man-made simulant. Even if there is some turquoise chalk in it, it is a manufactured substance with its hardness, color and other attributes artificial in origin. Not a "gem" material, and pretty much worthless (or worth slightly less than the recycle value of the plastic resin and bit of copper salt colorant that goes into it, assuming it's not toxic waste requiring an added fee to send to the dump), as it can be cranked out in whatever quantity anyone cares to order. Useful for "costume jewelry" and I also own some fakes for reference. I call that dyed, stabilized turquoise. If it has a huge plastic content it's just reconstituted block which is manmade.